California community college students looking to earn transferable credits online will have an easier time finding the courses they need for a degree through the California Virtual Campus (CVC) catalog. 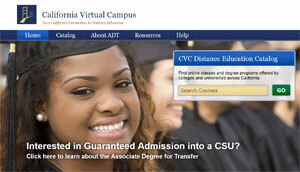 The CVC site at www.cvc.edu has recently been reengineered to emphasize courses that are required for an Associate Degree for Transfer (ADT), a program stemming from Senate Bill 1440 that guarantees students admission to the California State University (CSU) system. Now, students searching the site can see at a glance if a course will fit in to their education plans, according to Brice W. Harris, Chancellor of the California Community Colleges (CCC). A team from the CCC Online Education Initiative (OEI) undertook the CVC redesign as part of a broader offering of online education services being developed and tailored to the diverse needs of the CCC’s 2.1 million students. Offering online course management systems and an OEI Course Exchange for free or at low-cost to the individual community college campuses. CVC’s new focus on ADT course offerings serves as a bridge to the eventual OEI Course Exchange, a system that will enable students to take ADT courses online through participating CCC campuses if they are unable to get the classes locally. Down the road, the CVC catalog will highlight courses that are part of the exchange, and will be accessible through a statewide student services portal being developed by a partner program, the CCC Education Planning Initiative, noted Steve Klein, Statewide Program Director of the OEI. According to the CCC Chancellor’s Office, more than 29 percent of California’s community college students will take a class offered through online education this year, up from 12.5 percent in the 2005-2006 academic year. The CVC catalog provides information about 1,400 academic degree programs offered entirely online, and more than 19,000 online courses—all offered by accredited California higher education institutions, including the community colleges. Of those courses, 2,500 satisfy ADT requirements. Flagging every ADT course on the site was a significant undertaking, said Amy Carbonaro, an OEI project manager who led the CVC redesign effort. In addition to an updated look that’s more visually pleasing, CVC users will find a new tab that explains what the ADT is, and how students can benefit from it. Links to external resources to learn more about ADT are also provided. New search functionality has been added that makes the site easier to use, overall. Foremost, the search feature defaults to ADT courses, so qualified listings will appear at or near the top of search results. It is possible to disable the ADT default by clicking a box. Additionally, users can initiate a search from the home page, where before a user had to click into the catalog to search for courses. Functionality has been streamlined to make narrowing results by subject, school, segment and term more intuitive. And an option has been added to search for courses by geographic location. Distance Education coordinators will also find a simpler, more intuitive interface for adding or editing course information in the Admin Dashboard, as well as a new automatic error check with visual alerts. The operation to add courses in bulk remains a simple spreadsheet upload. With the annual CVC catalog update scheduled to take place in the June-July time frame, now is an ideal time for course/program maintainers to check out the redesigned CVC site, review their course listings and make any changes prior to the new catalog being published for the fall term, Carbonaro added. Crista Souza is a TechEDge News Contributing Editor.